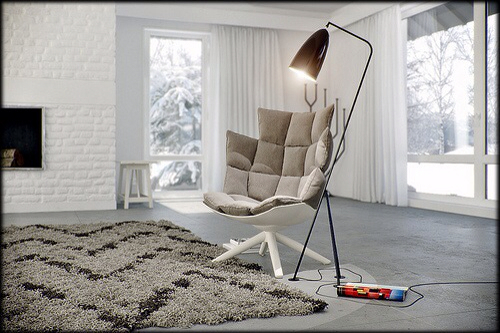 “Untitled Project: Eames Armchair Rocker (+ Walden)” by Conrad Bakker, 2012. Oil on carved maple wood. | Photo courtesy of © Conrad Bakker. CHAMPAIGN, ILL.- Modernism has ignited a new passion among designers and collectors, who value the movement’s objects as historical icons. It also has inspired artists who are using modernist design objects in their own work to comment on the movement’s cultural significance. That artwork forms the exhibition “MetaModern,” opening at Krannert Art Museum on Jan. 29. It is one of five temporary exhibitions at the museum. The opening night reception is 6 p.m. Jan. 29, with comments by “MetaModern” co-curators Ginger Gregg Duggan and Judith Hoos Fox. Duggan said the current artists interpreting modernism are manipulating the objects themselves – modifying or transforming or even destroying them in ways that comment on modernism. For example, Conrad Bakker, a painter, sculptor and University of Illinois art professor, has a series of paintings in the exhibition called “Untitled Project: eBay (Ding).” They are based on modernist objects for sale on eBay and the photographs documenting damage to those objects. The exhibition includes “My Decoy” by Brian Jungen, in which he transformed a Verner Panton cone chair into a Native American drum; a video projection by Josiah McElheny based on the J. and L. Lobmeyr chandeliers from New York City’s Metropolitan Opera House; and William Cordova’s “Endless Column,” which reproduces Constantin Brancusi’s 1918 “Endless Column,” reconstructing it from lampshades. Krannert Art Museum is the first of six locations around the country that will present the “MetaModern” exhibition. “Hopper Origami” by William Wegman, 2014. Oil and postcards on wood panel. | Photo courtesy of © William Wegman. Also opening Jan. 29 is an exhibition of work by artist William Wegman that will include a number of his photographs of Weimaraners, for which he is best-known. The exhibition, titled “Artists Including Me: William Wegman,” will include photographs, drawings and paintings. It will feature some of his paintings from the last 10 years, in which he used postcards to create narratives about what might be happening beyond the frame. It also will include work that relates to other well-known artists or artwork, often in a humorous way. “There are some great paintings that reference the expressionist Wassily Kandinsky and others that playfully relate to Edward Hopper,” said Kathryn Koca Polite, co-curator of the exhibition with museum director Kathleen Harleman. Wegman, who earned his master of fine arts degree from the U. of I. School of Art and Design, will be at Krannert Art Museum for an artist talk at 5:30 p.m. March 5. “In the Bauhaus” by William Wegman, 1999. Color Polaroid. Photo courtesy © William Wegman. Both the Wegman exhibition and another new exhibition, “Versions and Revisions,” include pieces that relate to recognizable artists or styles, in the same way the artists in the “MetaModern” exhibition “are riffing directly from these iconic modern designs,” Koca Polite said. She curated the “Versions and Revisions” exhibition, which opens with the others on Jan. 29. The exhibition features works from the 1960s through the early 2000s that are part of the museum’s permanent collection. “Speculative Visions of Pragmatic Architecture” is curated by U. of I. architecture professor Jeffery Poss and features the work of four U. of I. faculty members in the School of Architecture’s Detail and Fabrication program. 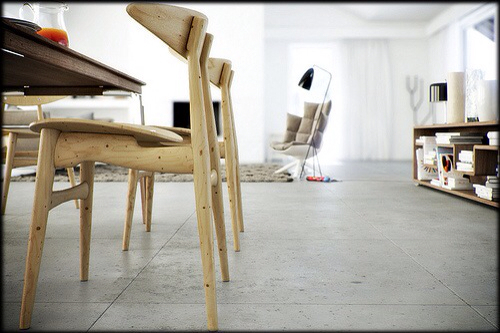 Their work focuses on the process of making and the evolution of ideas manifested in physical form. A second portion of the “Speculative Visons” exhibition highlights the design and preservation work of architecture professor Erik Hemingway. “Erik Hemingway Modernism” documents Hemingway’s preservation work on mid-century homes in Illinois and California. Continuing at the museum through May 17 is a significant exhibition of Japanese prints, curated by U. of I. art history professor Anne Burkus-Chasson. “With the Grain: Japanese Woodblock Prints from the Postwar Years” examines the deep history of this diverse art form and the ways in which these prints helped shape perceptions of Japanese culture outside of Japan. 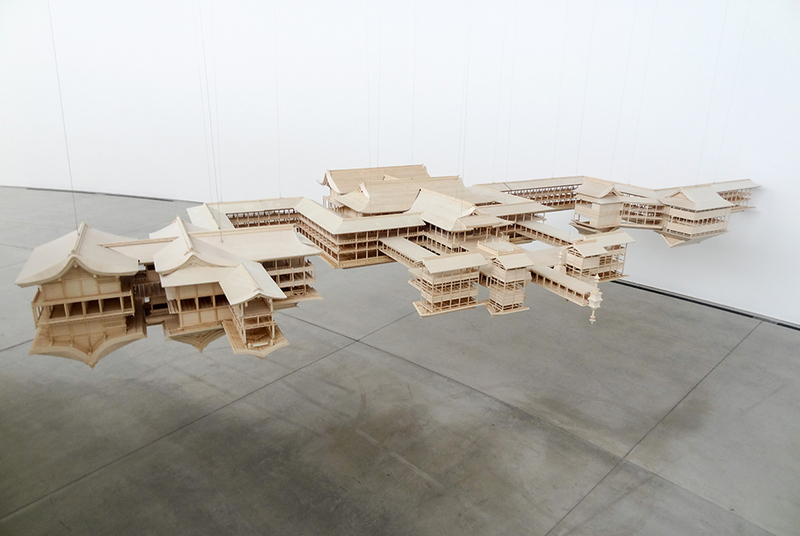 Takahiro Iwasaki, Reflection Model (Itsukushima) 2013-2014. Japanese cypress wood, bass wood, wire. Installation view at Aomori Contemporary Art Centre (ACAC). National Gallery of Victoria, Melbourne Felton Bequest, 2014 © Takahiro Iwasaki, courtesy of the artist and ARATANIURANO. MELBOURNE.- Japanese sculptor and artist Takahiro Iwasaki, renowned for his awe-inspiring, large-scale miniatures of ancient Japanese buildings and architecture, unveiled the latest epic work in his Reflection Model series at NGV International on 5 December 2014. The Reflection Model series recreates ornate buildings and their inverse image, as seen reflected on the water that surrounds them. Iwasaki and highly skilled assistants produced Reflection Model (Itsukushima) over a three-month artist-in-residence period at the Aomori Contemporary Art Centre. The sculpture is primarily constructed from the traditional building material of Japanese cypress wood, and the roofs of the central pavilions have been coated with a basswood veneer. 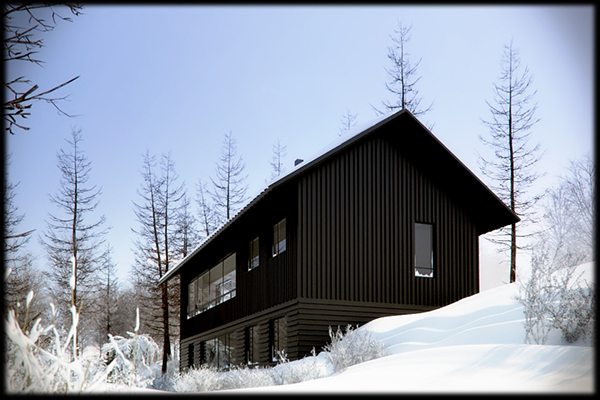 In the tradition of Japanese architecture, Iwasaki has maintained the timber’s natural finish with no treatment or coatings. Reflection Model (Itsukushima) is constructed from fourteen interlocking sections that utilise the age-old Japanese concept of ‘durability found in flexibility’ that has been a key to creating earthquake-resistant buildings in Japan. In recent years Takahiro Iwasaki has exhibited at the National Taiwan Museum of Fine Arts, Taichung; Palais De Tokyo, Paris; Hong Kong Arts Centre; Gallery C24, New York; and at the Mori Art Museum, Tokyo. Curator Wayne Crothers will present a free talk at 12.30pm on Friday 5 December, providing insights into Iwasaki’s intricate model. 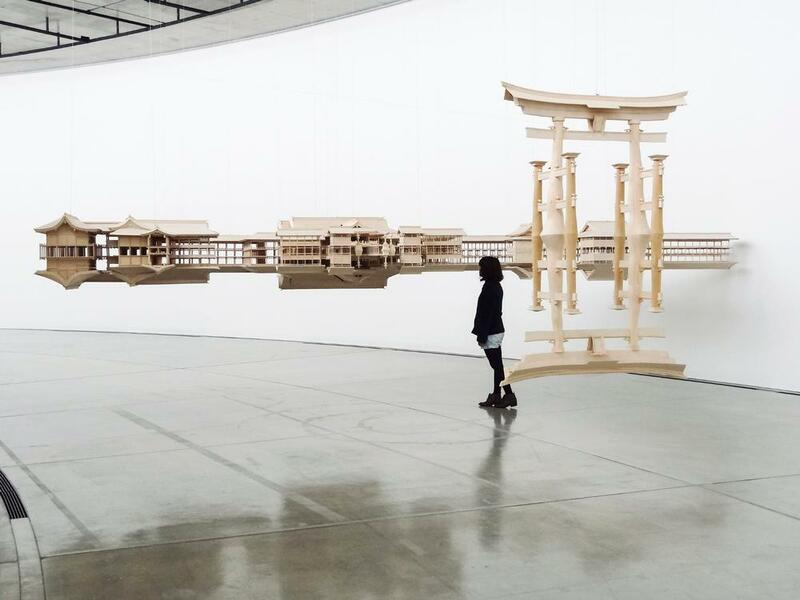 Takahiro Iwasaki’s Reflection Model (Itsukushima) will be on display at NGV International from 5 December 2014 to 6 April 2015. This acquisition is supported by the Felton Bequest, 2014. Japan Itsukushima Shrine and its famed ‘floating’ Torii gateway is one of Japan’s most revered and spiritual sights. Established in the year 593 in the city of Hatsukaichi in Hiroshima Prefecture, Japan, the shrine was rebuilt and expanded to its current configuration by Taira Kiyomori (a military ruler of the twelfth century) in 1168. The entire shrine, including its many corridors, sacred buildings and historic Noh theatre, are constructed over tidal flats that allow the entire shrine complex to float and reflect on the water’s surface as the tide rises. The building serves to enshrine sacred objects, facilitate ceremonies and house traditional performances. During the sixteenth century Itsukushima became widely known as one of Japan’s Nihon Sankei (three most celebrated sights) and was the subject of luxurious golden screen paintings and woodblock prints. 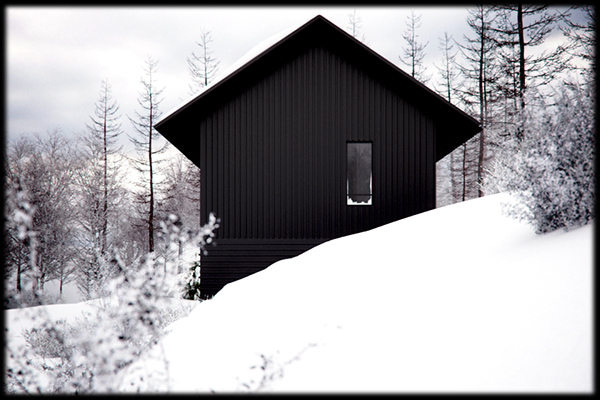 Rendering of the Munch Museum, Oslo, designed by Herreros. OSLO – Oslo city officials have finally given the green light to a contested new Munch Museum project. 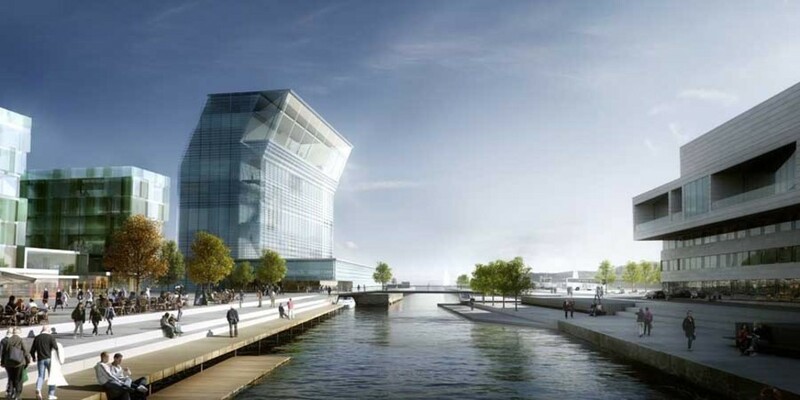 Several years of negotiations have resulted in approval for the building designed by architecture firm Herreros with a budget NOK 2.8 billion (USD 430 million). The trove ofartworks given by artist Edvard Munch to the city will be moved from the Toyen district to a eastern waterfront site next to the Opera House. Some objected to the museum’s design as overshadowing the opera house. The so-called « Lambda’ design will be a glass high-rise that appears tilting. The acting city politician in charge of cultural affairs, Anne Siri Koksrud Bekkelund from the Liberal Party, said the museum “will mean more tourists in Oslo both from within and outside the country.” The opening would be in 2019. 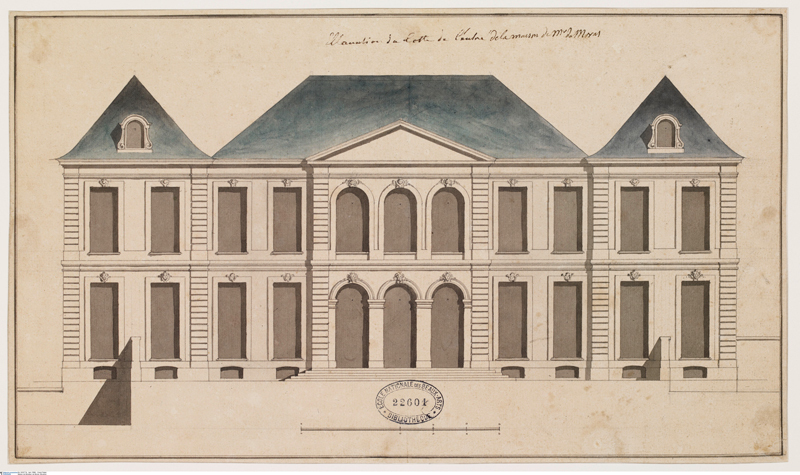 BERLIN.- The Tchoban Foundation is showing 65 art works of Hôtel particulier buildings – prestigious town houses, which were built in the first part of the 18th century and characterize Parisian architecture until today. 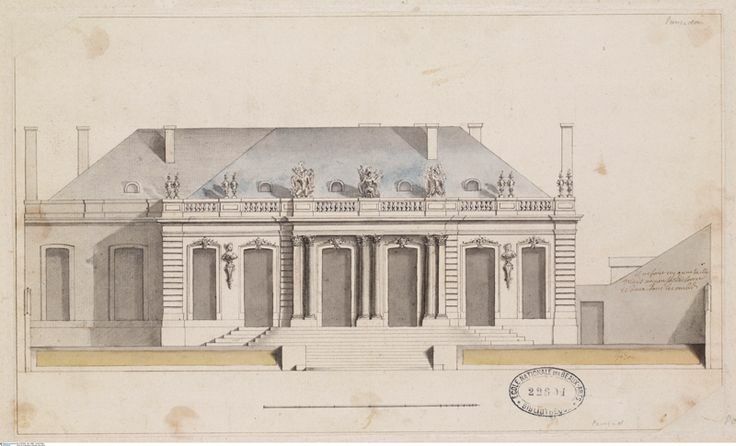 After Sergei Tchoban, architect and founder of the Tchoban Foundation for Architectural Drawing, showed his collection of 24 drawings at the École des Beaux-Arts in 2011 with the exhibition “À la source de l’ Antique. La collection de Sergei Tchoban”, the two institutions now continue their collaboration, this time with a selection of works from Paris that are being displayed in Berlin. The displayed hand-drawn views, cross sections and floor plans are part of the large collection of École nationale supérieure des Beaux-Arts, which is internationally acclaimed both for its singular monumental architecture as well as for the standard it sets in education. The École’s collection is a treasure-trove of hand-drawn works, only rivaled in quantity and quality by the Louvre. The exquisite works on paper span a range from the Renaissance until today, presenting masters such as Leonardo da Vinci, Raphael, Rubens, Poussin and Bucher side by side. 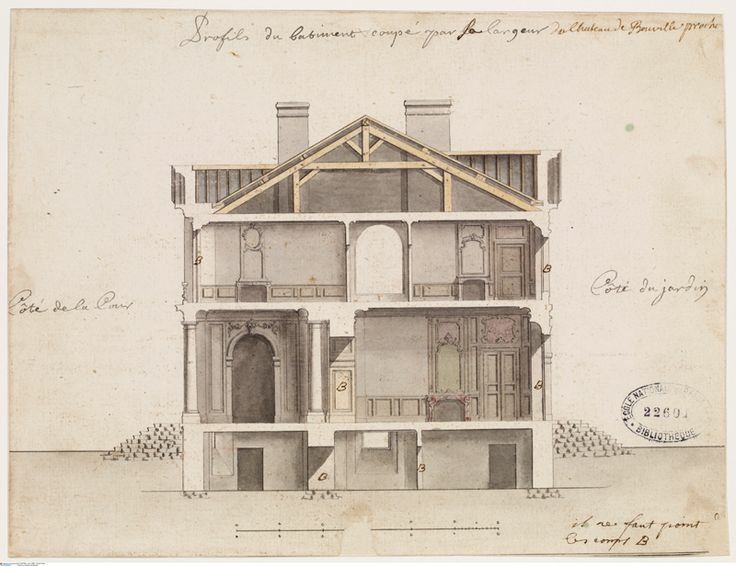 The exhibited drawings are designs for L’Architecture françoise’s printing plates. The three volumes, published between 1727 and 1732 by Jean Mariette, were intended to impress all of Europe with France’s architectural excellence. Renowned Parisian businessman and publisher Jean Mariette commissioned young architects Jean Michel Chevotet and Pierre-Charles Prevotel to depict the buildings from various points of view. The drawings were executed to a precise and detailed standard, the better to convincingly depict the spirit, daring construction and decoration of each building. The town houses were built by the greatest architects of their time, Germain Boffrand and Jules Hardouin-Marsart in particular. 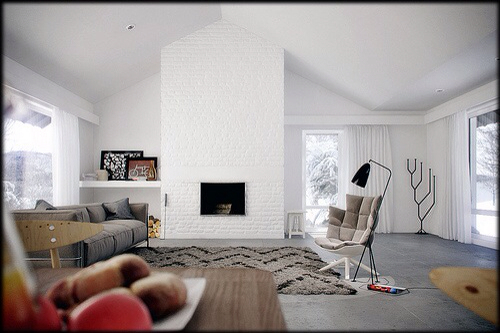 The French nobility enlisted them for their dwellings that were primarily built in the 7th Arrondissement. Today, mostly ministries and embassies reside in these grand buildings. The exhibition is curated by Emmanuelle Brugerolles, Chief Curator of Drawings Department at the École des Beaux-Arts.